Chef King received his formal culinary education from the esteemed Culinary Institute of America, and graduated in 1998. Chef King went on to train under Daniel Boulud at Restaurant Daniel and David Bouley at Bouley Bakery and the Danube where he sharpened his classical training and knowledge of the craft. Other New York kitchens where Chef King has worked include: Jean-Georges, The Grocery, and Cendrillon. He was co-executive chef at Beekman Kitchen in New York and executive chef at Fatapples in El Cerrito, California before venturing on his own. 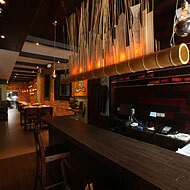 In May of 2003, the chef opened Kuma Inn on the second floor of a Lower East Side tenement in New York. Chef King brings all his experiences together, including the flavors he grew up with, to the community dining style from the Philippines, his education with some of the world’s best chefs, and exposure to the freshest ingredients to offer a unique dining experience. Within the first year, Kuma Inn was rated “one of the city’s best places to eat 2004” by New York Magazine. The New York Times wrote, “It is Filipino mama food and fantastic.” King has received numerous accolades from various premier publications. Another restaurant is in the works which promises to continue taking diners to new and exciting culinary heights. The restaurant ‘in the works’ is called Umi Nom and is now open in Brooklyn and receiving great reviews. 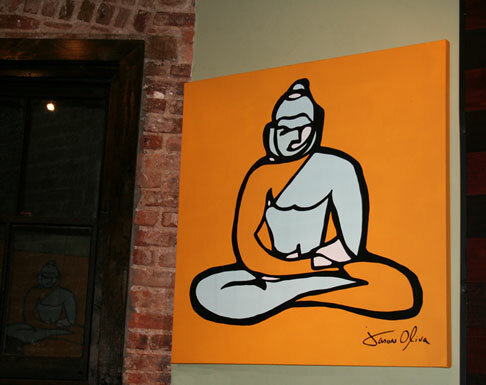 If you are in the city, stop by for a great meal and to view ‘Buddha” in person … and say hello to Chef King! Thanks to everyone who discovered the painting on their own and sent in emails and comments. Checkout Umi Nom’s public fanpage for more information. Previous New York to England … now onto France! "Blue Shudders" the new studio.